"White's ravishing recap of the world's heartbreakers provides portraits of women who knew how to work it (and a few who are still at it), breaking down their immortal charms into imitable archetypes...dashing, fun and informative, the book is a spirit-lifting tonic for any woman with a case of the gravity blahs." Within the pages of Simply Irresistible, the collective wisdom of some of the great sirens of history—among them, Eva Peron, Greta Garbo, Coco Chanel, Nigella Lawson, Angelina Jolie, Edith Piaf, Mata Hari, Jacqueline Kennedy Onassis—has been distilled to its essence, and embellished with homespun lore (see the Gallery of Sirens). Maybe you’ll borrow a page, a chapter, or a few of these lessons in love. Maybe you’ll become a disciple. Simply Irresistible is authored by Ellen T. White, who speaks publicly on women's topics. White has made a systematic study of the sirens among her family, friends, and the seductive women of history for the secrets of their success, which she has distilled into Simply Irresistible. Read more about Ellen T. White. 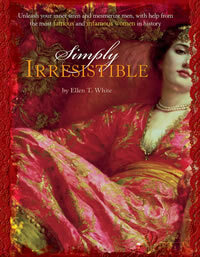 See Ellen White discuss SImply Irresistible on video.